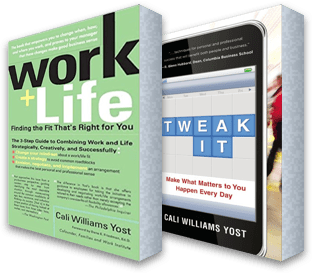 It’s one thing for me to passionately extol the virtues of shifting from work-life “balance” to work+life “fit.” It’s quite another for someone else to explain why it makes a difference for them. “The term was coined by a mentor of mine, Cali Yost, [CEO and founder of Flex Strategy Group]. I love it because, first of all, work/life balance is a lie. Anyone can tell you that. I don’t like work/life balance for two other reasons. The first is that I think it’s become totally twinned with parenthood and being a working mom, and that is not good for anyone. There are a lot of people who don’t have kids at home and who really crave a life. Let’s be honest: It’s not about having kids. The other thing is that we want to work in a way that suits us, like we just talked about. You’re on, and then you’re off for a little while. That’s your work-life fit. I have friends, clients, my husband, who love to work all the time. I don’t judge them. That’s their work-life fit. I really love my work, but I need to work in a space that I can control.